We're keeping tabs on the very latest Hurricane Irma news and notes. We're posting information as it comes in. The Coast Guard ordered Port Condition YANKEE for Port Tampa Bay, Port Manatee, and Port St. Pete. Port Tampa Bay is closed to inbound vessel traffic, all oceangoing commercial vessels greater than 500 gross tons must depart, container stacking is completed and all cargo operations cease. The next and final elevated alert status is Port Condition ZULU, when all port operations are suspended. Legoland will be closed Saturday through Monday. Busch Gardens and Adventure Island will be closed Saturday through Monday. Tampa International Airport is ceasing flights at 8 p.m. Saturday. There was a mandatory evacuation notice issued for MacDill Airforce Base noon Friday. The Florida Department of Transportation and the Florida Highway Patrol have implemented a limited emergency shoulder use plan for Hurricane Irma evacuations on Interstate 75 at Wildwood to the Georgia state line. Motorists should only use the left shoulder when directed by law enforcement and highway signs. Click here for the specifics. Gov. Rick Scott and Tampa Mayor Bob Buckhorn spoke about Hurricane Irma preparations across the state. City of Tampa residents in Zone A have a mandatory evacuation starting at 2 p.m. Friday. "If you know you're going to evacuate, do it today," Scott said. The state has received more than 6,500 complaints of price gouging, according to State Attorney General Pam Bondi. She asked Florida residents to report scams by calling 1(866)966-7226 or by visiting FloridaLegal.org. The city of Tampa is issuing a mandatory evacuation for Zone A residents starting at 2 p.m. Friday ahead of Hurricane Irma. The National Hurricane Center issued a hurricane watch for Hillsborough, Pinellas and Polk counties. Citrus County has issued mandatory evacuations for residents west of US-19. Hurricane Irma has maintained its strength Friday morning as a 150 mph, Category 4 storm. It is both a powerful and extremely dangerous storm: a 150-mph wind is just that, bringing the threat of catastrophic damage. Irma is about 405 miles southeast of Miami as of the 11 a.m., Sept. 8, update from the National Hurricane Center. It is moving west-northwest at 14 mph. The minimum central pressure is 927 mb. Hernando County issued mandatory evacuations for residents in Zones A and B.
Pasco County issued mandatory evacuations for residents in Zones A and most of Zone B.
Gov. Rick Scott addressed the public on preparations ahead of Hurricane Irma. The U.S. Corp. of Engineers believes excessive wind from Hurricane Irma will push some water over the dike at Lake Okeechobee, according to Scott. The group does not believe the dike's structure "will be compromised," according to Scott. Interstate 75 North at mile marker 321 is closed in Sumter County. The Florida Highway Patrol is at the scene of a two-vehicle crash there. A voluntary evacuation notice is issued for people in Zone A, the barrier islands and those who live in mobile homes. Brookside Middle School, 3636 South Shade Ave., Saras, will be a shelter. Polk County has issued a voluntary evacuation for mobile homes. The county will open nine public shelters at 7 a.m. Saturday ahead of Hurricane Irma. The city of Tampa has run out of sandbags, but tweeted that more were on the way. FEMA administrator Brock Long and U.S. Secretary of Health and Human Services Tom Price spoke on preparations ahead of Hurricane Irma. Long tried to explain the significance of Hurricane Irma. "Nobody in Florida that I know has ever experienced a Category 4 or 5 storm making landfall," Long said. "The nation has only seen three Category 5 storms since 1851." Long also said there is more certainty in the Hurricane Irma forecast compared to the forecast a few weeks ago for Hurricane Harvey in the Houston area. Price praised the preparations of Florida Gov. Rick Scott, Georgia Gov. Nathan Deal and South Carolina Gov. Henry McMaster. Southwest Airlines canceled all flights in and out of Tampa International Airport for Saturday and Sunday. Frontier Airlines has canceled all flights in and out of Tampa International Airport for Sunday and Monday. The city of St. Petersburg has distributed its entire supply of sandbags. St. Petersburg city workers gave out a total of 152,000 sandbags at six different sites over three days to help residents prepare for Hurricane Irma. No St. Petersburg sandbag sites will be open on Friday. There is a slight weakening trend with Hurricane Irma as of the 5 a.m. National Hurricane Center update pegs it as a 155-mph, Category 4 storm. But "weakening" does not mean not powerful nor not extremely dangerous: a 155-mph wind is just that, bringing the threat of catastrophic damage. Hurricane warnings have been issued for South Florida as thousands of people evacuate. More than a half-million people have been ordered to leave the region ahead of Category 5 Hurricane Irma. The watch is in effect from Anna Maria Island south to Bonita Beach, including Manatee, Sarasota and Highlands counties. Tropical storm force winds are anticipated 48 hours after the watch is declared. The warnings include the Keys and an area of the peninsula including metro Miami and Lake Okeechobee. Storm surge warnings cover both coasts along the state's tip. Florida Gov. Rick Scott ordered all public schools, colleges and universities to close Friday through Monday. Irma remains a Category 5 hurricane with winds around 160 mph as of the 2 a.m., Sept. 8 update from the National Hurricane Center. 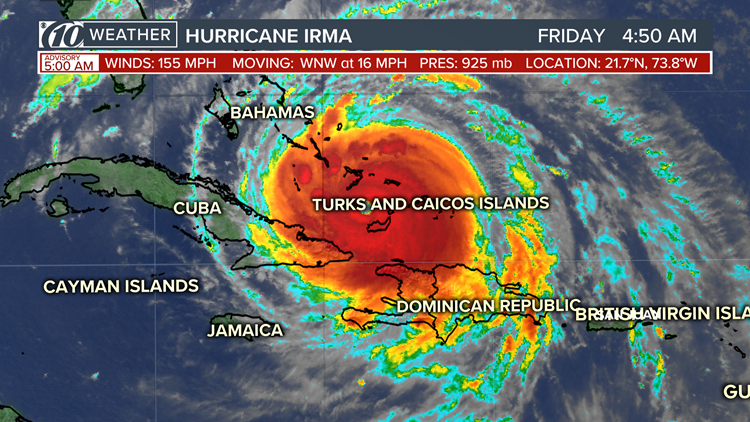 Hurricane Irma is about 20 miles north of Great Inagua Island and about 535 miles east-southeast of Miami. The minimum central pressure is 925 mb.